We are proud to announce that we are expecting our 2nd child in 2010. The baby's due date is May 22nd. However, April will need a C-section so the delivery will be scheduled around the 15th unless he/she decides to come even sooner! We're looking forward to the surprise on the big day to see if we're having a boy or a girl. A boy's name is set in stone, but we've got a couple girl's names to work with. The baby will go into Sammy's nursery and Sammy will move into a new room with a cool dinosaur theme. 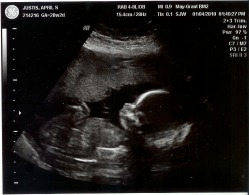 01/04/10 - Baby's fourth ultrasound. 11/16/09 - Baby's third ultrasound. 11/06/09 - Baby's second ultrasound. 10/05/09 - Baby's first ultrasound. 09/13/09 - April takes the home pregnancy test.